HILTON HEAD ISLAND, SC -- It's strange how little things affect your confidence, especially in golf -- and I think this factors into the mind-game many a golf architect plays when scribing a layout. I sometimes wonder if course designers really think about what it's like heading to the first tee at one of their creations -- at times without a warm-up; other times when there are tons of people milling around, and still others when the starter's standing directly in back of you, sizing up your worldly abilities with your first swing of the day. Enough to give most anyone the shakes. It's moments like these when you'll need a playable golf course. The last thing you'll want to see is a 200 yard forced carry over water or some other God inspired hazards where your chances of arriving safe on the other side decrease exponentially with each yard and every nerve you're fighting. Give me a green-carpeted, flat runway all the way to the green on the first hole -- I'll breath a sigh of relief and try and make my best swing. 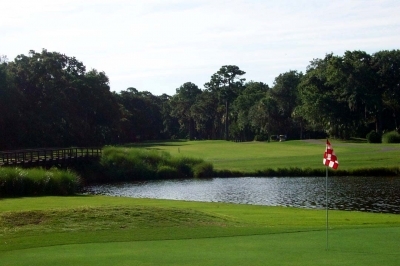 If you're anything like me, then you'll enjoy taking your first steps at the Robert Trent Jones Course at Palmetto Dunes on Hilton Head Island. The view from the first tee is one of complete comfort -- the signature Trent Jones long runway tee box, followed by a nice, flat rolling area and plenty of room to miss -- all the way to the green. Shank one and you're in the trees, but at least you're not calling on the first tee mulligan (gentleman's rule) or reaching for another ball to drop, starting off hitting three. I will add one thing though -- our rather colorful starter on the morning we played made that first shot a little more difficult, even within the friendly looking confines of the course. Al Mooney first ran through his playing recommendations for the layout, then suggested pace of play might be a few minutes slower than normal, due to some of the golfing talent (or lack thereof) he'd seen pass before us. Mooney put it candidly, "We get some of the worst golfers in the world out here sometimes, and there's not a thing we can do about it." And although I'll freely admit I play from one of the back sets of tees most of the time, I timidly walked with my driver between my legs for a shot from the white tees -- I couldn't stand the pressure of having to hit one from the back tees in front of Mr. Mooney. Luckily, I managed to rip a good drive down the middle and avoid being thrown to the lions. I could've stunk it up the rest of the day and still left happy, knowing the most important shot of the day went well. 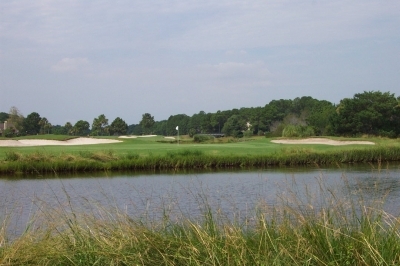 Back to the course, the RTJ layout at Palmetto Dunes is very playable. 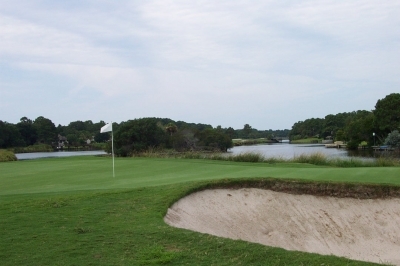 Head Pro Kenny Conroy says it's the best one at Palmetto Dunes to start a vacation with, if perhaps you haven't played in a while: "It was the first golf course built here at Palmetto Dunes (opened in 1969), and was created with the average player in mind. It seems like these days, the older courses are a tad friendlier to the recreational golfer." 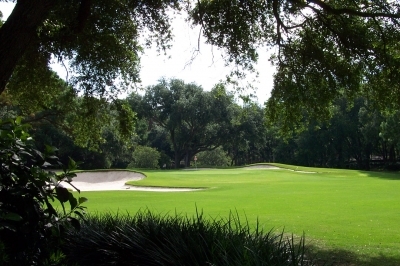 "We'll find most of our resort guests come to this course first, because it offers a better opportunity for them to get back into their games than some of the others at our resort (including sister Plantation Palmetto Hall, there are two Arthur Hills courses, a George Fazio layout and a Robert Cupp design). It's a great golf course for all skill levels of golfers." 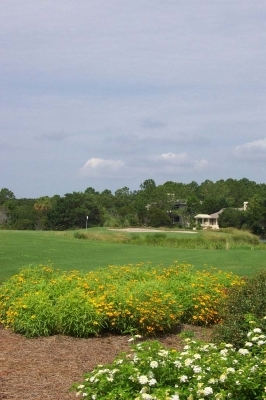 In addition to its friendly characteristics, the RTJ Course also offers something few others (on Hilton Head Island or otherwise) can speak of -- Oceanfront property. Back to back par fives nine and ten lead out towards the ocean, and the number 10 green provides a splendid look at the crashing waves just yards away. Very inspiring. The balance of the course winds in and out of open spaces with some tree-lined areas, all the while skirting a beautiful lagoon system. And although Conroy emphasized the easier aspects of the course -- from the back tees (which we assumed playing after graduating from the Mooney school of swing assessment on the first tee), the course is actually pretty challenging. The course does feature generous landing areas on virtually every hole requiring distance off the tee, and huge greens that have become another Robert Trent Jones signature. 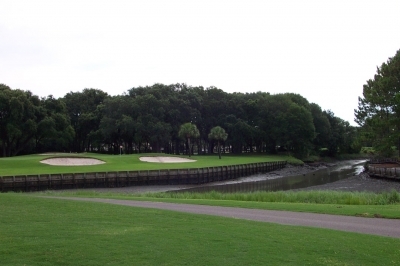 But you'll also need to avoid any number of hazards that await you -- the layout is very well bunkered and there's quite a lot of water/wetlands (the lagoon system comes into play on 11 of the 18 holes) to contend with. There're only a few real forced carries -- but they'll keep you on your toes when you find 'em. Finally, the championship tee yardage of 6710 yards with slope of 133 accurately depicts what you'll face -- a mid-level golf course that sets up well for some scoring opportunities, but will also leave you with high numbers if you're not careful. I'll note, the white tees do play quite a bit friendlier at 6148 yards and slope of 124, so I can see where moving it up a notch would make for a good, playable, 'warm-up' for folks who may not have strapped on spikes in a while. So, there are real choices for which tees to play -- nice to have. As noted above, the first hole is a straightaway 400 yarder (from the back tees, with a wide landing area for first tee balls, tree trouble to both extremes. The approach shot introduces you to the 'greens theme' you'll see throughout, a slightly elevated putting surface, well bunkered on all sides -- with some noticeable undulations. Conroy describes the flow of the layout: "It starts off a little tough (holes 1-3), then gets a little soft for ya (4-8), and gives you a great look out to the ocean off those two holes (9, 10), then finishes up with some strong holes (16-18)." A very accurate synopsis -- but then again, it should be, he's the head pro. The second is one of the toughest on the course, despite being only 383 yards in length. Take the wind into consideration off the tee, as long-hitters must contend with a lagoon that separates the fairway landing area from the green complex. If your tee ball's in trouble, it may even require a layup on the second, as it's tougher to carry the water than it looks (known from personal experience). If the pin's in front, you'll compete with bunkers right and left for your ball's final resting place. The third's a tricky par four, only 361 yards but doglegged right and the fairway's protected by bunkers on the right side for those trying to cut the leg. An extremely tough green to hold, as it slopes down from the middle to all sides. Four's green is modeled after the eighth hole at Augusta National (long par five with an hourglass shaped green, mounding surrounding it). Conroy pointed this out, and looking back, he was right! 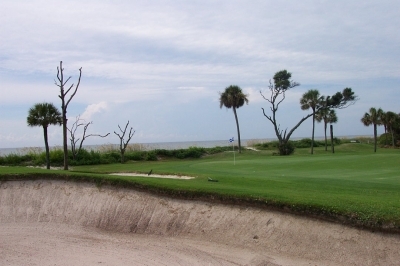 Eight's a great par three that you can see from the road when passing by Palmetto Dunes. 212 yards from the back, it's all carry as you'll go over water to the short extreme, and bunkers immediately short of the green. More bunkers wait for a pulled shot left or long. The green's a big target, so the hole plays easier than it looks. The par five tenth probably receives the most press on the course, as the green overlooks the beach. The driving area is extremely generous, as is the landing area for second shots. It may be reachable in two, depending on the wind off the water. One of the more memorable green views you'll get in this golfing lifetime. Twelve's a nice par three, only 154 yards (and usually with the wind), but nearly a full water carry and big bunkers all around. Anything short and right is gator food (though we didn't see any at Palmetto Dunes, I'm sure they're there somewhere). Thirteen's got probably the toughest tee shot on the course, especially from the back tee boxes. The day we played, it was directly into the wind, and requires a 200 yard plus carry over water to reach a semi-peninsula fairway. Intimidating visually, and can play very tough if the wind's the way it was for us. Seventeen's another good par three -- 179 yards to a well bunkered green that slopes left to right -- any balls in that direction will roll off. A creek runs through at mid-hole, but won't come into play. All in all, a nice set of par threes on the course. Eighteen is an excellent finishing hole, a 390 yard, sharp dogleg left. You can't see the green from the tee, and there's out of bounds left and right. Depending on the wind, you may want to club down, as there's also a large bunker long and through the fairway. Second shots are to a final well-bunkered, elevated green. Finishing up, you'll probably want to stop and take in a cold one on the deck of the RTJ course's terrific clubhouse. You'll notice that you can see the first tee quite well from your view, presenting the opportunity to take in the first shots of anyone else willing to give the course a run. You'll probably be glad when that shot's over for the day -- but for the rest of the course, it's a smooth playable ride. So sit back and enjoy. There is usually some kind of special -- call the pro shop for rates.